I remember how absolutely boring I found Henry V in my high school Shakespeare class-enough to swear off the history plays forever- but even then I suspected seeing them performed would be a different experience entirely. I was definitely right, and The Hollow Crown is some of the best Shakespeare I've ever seen performed. 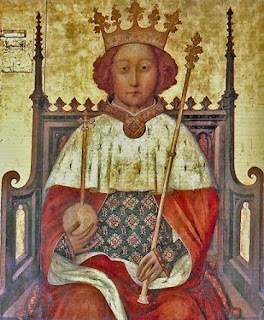 I was especially surprised at how much I loved Richard II, since I thought I'd have little interest in it. I definitely want to watch it again, and I totally recommend the rest of The Hollow Crown. I still haven't seen Season 2 yet, though, which apparently includes Henry VI and Richard III. Our gr. 7 teacher had us memorize Gaunt's England monologue for which I am eternally grateful. I've gone back and refreshed it over the years because it's so good. I still have my study copy of Richard II, missing its cover and filled with sarcastic marginalia and loving doodles of people dying grotesquely. All part of the rich experience of boyhood Shakespearean appreciation. I remember we used rolling desk chairs as horses when we acted out the jousting scene. As a class of boys we were allowed to have one pass at each other even though it was contrary to the script. A wise concession to male bloodlust. Good times. Hayden, yes! I was surprised how much I liked this play too (though there were definitely parts where I wished Richard would just shut up :P). I'm hoping to tuck into HENRY IV PART 1 tonight *rubs hands*. Joseph, haha, that sounds like lots of fun. Sarcastic marginalia - sounds like an heirloom! 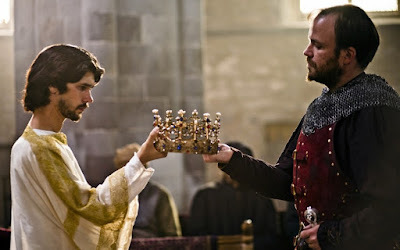 I also loved The Hollow Crown - definitely see Henry IV Part I if you can get it! You probably already know this, but the conspirators of Essex's rebellion paid the Lord Chamberlain's Men to play Richard II just before their attempted uprising - so censorship on Elizabeth's part may have been a smart move. Yes, I had heard of that! I recently saw Richard II (The Hollow Crown) and was surprised at how good it was. I then rented an older version BBC version from the 70s to compare them, and found the "Sceptr'd island" speech more moving in the modern one. Not having grown up in an English speaking country, I was not aware of this particular play nor knew any of its memorable passages (though I've read the most famous non-historical plays, and I've seen a few of the historical ones played by Laurence Olivier). There are no words for the feeling in hearing the speech about the death of kings, or the sceptr'd island for the first time... I was in awe. Looking forward to watching the rest -and reading your commentary afterwards. Mariangel, having seen all the HOLLOW CROWN productions, I do think they aced Richard II. The later adaptations were a little over-edited for my tastes, although they are all good television. Hope you enjoy the rest of them!